There are a couple ways a tax rate can be changed in a sale, depending on how/why the rate is different. Make sure to double-check which method is right for your situation. If this is a one time situation where the sale, customer, or sales item(s) should not be taxed, you can update the sales item(s) tax rate during the sale. Any tax changes to the sales item(s) will not affect the product or customer in future sales. 1. Double-click the sales item you want to edit. 2. Select the Edit icon next to the Tax Rate field. 3. Update the boxes in the Sales Item column in the grid to match the item's approved rate. 4. The updated rate shows in the Effective Tax Rate field on the bottom of the window. 5. Select Save on the Tax Rates window. 6. Select Save in the Sales Item window. To edit this information during a transaction, a customer must be attached to the sale. Customers that commonly get tax discounts or are exempt from taxes include: out-of-state customers, non-profits, schools, and police departments. Check with your manager or owner to see what customers are tax-exempt at your store. 1. Double-click the customer's name to edit their customer record. 2. Locate the Tax area on the upper right. 3. Add a Tax ID, if needed. 4. Select a Tax Exception Reason from the drop-down menu. 5. Update the boxes in the Customer column in the grid to match the customer's approved rate. 6. The current tax rate for the customer is noted at the top of the tax area. For example: Tax - current rate 5.000. 7. Select Save or Apply. Some products or SKUs aren't taxed at some shops. This usually includes Labor SKUs. Double-check with your manager or owner before changing anything if you believe a product should not be taxed. 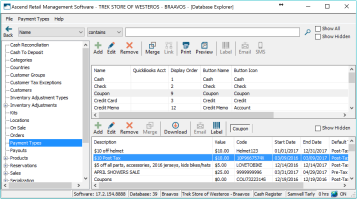 You can edit the product record from a sale or from Database Explorer outside of a sale. These directions assume you are starting in a sale. 2. Select the Edit Product icon to open the product record. 3. Click the Edit icon next to the Tax Rate field to edit the tax rate. 4. Update the boxes in the Product column in the grid to match the product's approved rate. 5. The updated rate shows in the Effective Tax Rate field on the bottom of the window. 6. Select Save in the Tax Rates window. 7. Click Save or Apply in the product record to save the changes. You cannot override a Coupon's tax setting in a sale. You will need to exit the sale to make this change. 1. Navigate to Databas Explorer. 3. Highlight the Coupon payment type. 4. Find the coupon you want to edit in the lower part of the screen. 6. You can select with Pre-Tax or Post-Tax for this coupon. a. Pre-Tax: the coupon amount is applied to the sale before tax has been calculated. So the "discounted transaction balance" is taxed, not the "full transaction balance". 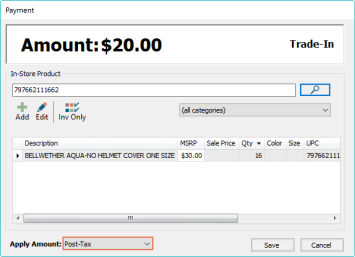 b. Post-Tax: the coupon amount is applied to the sale after tax has been calculated. So the "full transaction balance" is taxed. 7. Select Save after you've made your selection. Now you can return to the sale and apply the coupon. 1. Select the Trade-In payment type in the transaction. 2. Fill out the Trade-in product information like normal. 3. Use the Apply Amount drop-down menu to select how the trade-in should affect tax in this sale. a. Pre-Tax: the trade-in amount is applied to the sale before tax has been calculated. So the "discounted transaction balance" is taxed, not the "full transaction balance". b. Post-Tax: the trade-in amount is applied to the sale after tax has been calculated. So the "full transaction balance" is taxed. If you cannot edit the tax rate in any of these situations, you may not have the user permissions to do so. Reach out to your manager for a hand changing the tax rates or changing your user permissions (depending on your store's policies for use permissions). and possibly Advanced Payments, depending on if Trade-ins are marked as advanced payment types at your store.